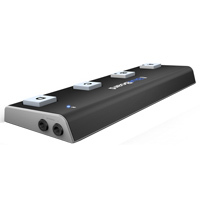 iRig BlueBoard is the first wireless MIDI pedalboard for iPhone, iPad and Macs, (supporting Bluetooth 4.0 / Bluetooth Low Energy). It features four backlit rubber-pad switches and two inputs for connecting optional expression pedals/switches. 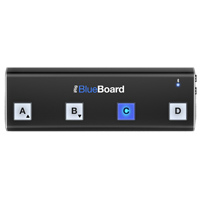 Bluetooth Wireless MIDI Pedal Board, Bluetooth Low Energy (BLE), extremely low power consumption, Backlit rubber pads for easy identification in the dark, Completely wireless, battery powered (4 x AAA), Completely customizable setup via the iRig BlueBoard dedicated iOS and Mac apps. 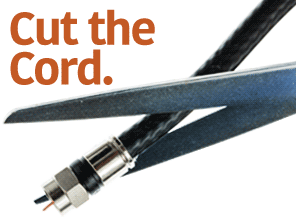 Communicates and maintains full control up to 32.8' from your device via Bluetooth.